FILE - The Arch of Reunification, a monument to symbolize the hope for eventual reunification of the two Koreas, pictured in Pyongyang, North Korea, Sept, 11 ,2018. South Korean President Moon Jae-in is pushing hard to link the roads and railways of the the two Koreas. 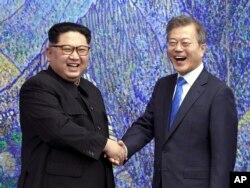 The plan to modernize North Korea’s outdated railways and roads and reconnect them with the South was among many agreements reached between North Korean leader Kim Jong Un and South Korean President Moon Jae-in, who met three times this year amid a diplomatic push that eased tensions over the North’s nuclear program. Kim also met with President Donald Trump in Singapore in June, when they issued a statement about a nuclear-free Korean Peninsula without describing how and when it would occur.